Teacup piggies -- often known as dandie pigs, mini-pigs or potbellied pigs -- are marketed as pint-size pets, but many grow to weights of 30 to 50 pounds, and others grow even larger at full maturity. Teacup piggies like to play, so you must have appropriate space for them. In many communities, even pet pigs are considered livestock and may not be allowed in some neighborhoods. Some piggies have to be rehomed as a result. Just like other domestic house pets, teacup piggies will be easiest to live with and play with if they learn basic obedience commands. Consistency is important to training teacup pigs, who can quickly and efficiently learn commands like dogs, including the Sit, the Stay, the Come and the Lay Down. Once you get your pigs used to following commands, you can create fun playtime activities to keep them entertained, active and healthy. Just like Fido enjoys playing catch, your teacup pigs can learn to fetch and retrieve as well. Find toys similar to what you would purchase for a dog, such as rubber balls or tennis balls. 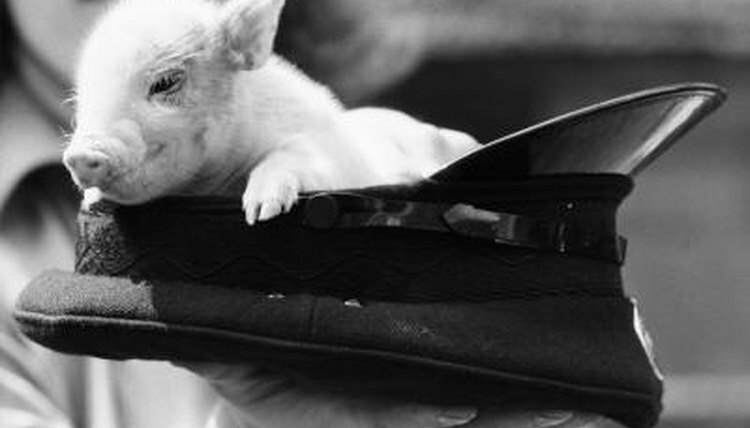 Teacup pigs also enjoy playing with stuffed animals; choose a low- or no-stuffing variety. Pigs will pull out and eat toy stuffing if left unattended. Play with your teacup piggie by teaching him tricks. A highly intelligent animal, a pig can be taught to to balance a treat on his nose, jump or roll over, or play within a homemade obstacle course. Pigs enjoy toys that you fill with treats that spill out when rolled. The earlier you start working with your teacup pig, the greater the likelihood you'll find enjoyable pastimes the whole family can participate in. Take your teacup piggie for a walk on a harness leash. Pigs are social animals who enjoy the opportunity to meet other people and animals. Use caution around potentially aggressive dogs -- they are prone to attacking teacup pigs. Just as you would clean up dog droppings, you'll need to clean up your pig’s droppings when you take him out in public places. An enjoyable play time activity for your pig is spending time with you. You can hold and snuggle a teacup piggie much like a cat or dog, rub his belly and simply enjoy each his company just as you would other household pets. Keep in mind that pigs can suffer separation anxiety and be destructive in your absence. Some breeders recommend keeping two pigs for company.